TEMPO.CO, Jakarta - The campaign acts of Prabowo Subianto and Sandiaga Uno, the presidential-vice presidential candidate pair number 02, in the sixteenth day of the campaign period, Monday, October 8, would mostly take place in Jakarta. Sandiaga was said to have more events than Prabowo’s. At noon around 1:30 p.m., Sandiaga would attend a discussion with millennials in Bebek Kaleyo restaurant located in Tebet, South Jakarta. Similar events were often established among others in Satu Atap Coworking Space Surabaya. After then, the former Jakarta deputy governor would leave to Gelora Bung Karno Stadium at 2 p.m. to watch the Asian Para Games volley match of Indonesia versus Iraq. Later at 9 p.m, Sandiaga would join in Tabligh Akbar Majelis Rasullah SAW in National Monument or Monas, Gambir, Central Jakarta. Meanwhile, the presidential hopeful would welcome his guests in his residence located on Jalan Kertanegara 4, South Jakarta. 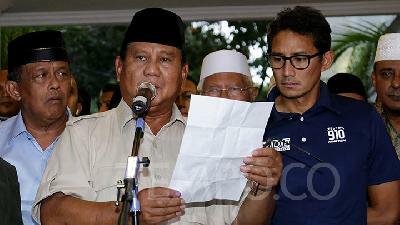 The meeting of the National Campaign Agency Prabowo-Sandiaga holds every Monday at Prabowo’s. 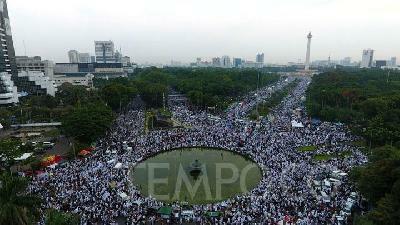 Earlier on Sunday, October 7, Prabowo Subianto and Sandiaga Uno held campaign events in other cities. Prabowo visited As-Syafi'iyah Pulo Air Islamic Boarding School (Pesantren) in Sukabumi, West Java. While, Sandiaga Uno toured to several pesantren in Jember, East Java.